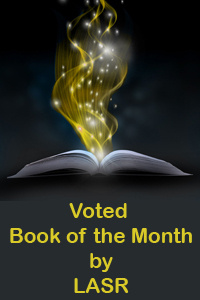 Mooner voted book of the month at LASR! This has truly been a whirlwind month and it’s not even ten days in yet! Seriously, I wanted to pause a moment and just say a big thank you to everyone who’s been working with me and supporting my work. At the end of the day, yeah writer’s have to write, but if there aren’t people to read it, it’s kind of a one-sided, lonely affair. So thanks to everyone who has rallied around me and believed in me. Hee hee hee. I’m so pleased, and thankful to everyone who voted and encouraged others to do so. You guys well and truly rock. If you missed the review the first time around, you can find it HERE – I may never stop blushing! If you’re curious about the title as a whole, click the cover!